Epoxy garage floors are an excellent investment in your home. They protect the floor from oil, gas, and other corrosive elements that often fall on garage floors, and they elevate the look of your garage at the same time. Yet myths about epoxy garage floor coatings in Queen Creek can prevent many from enjoying all the benefits they have to offer. Everyone thinks they can do their home improvement projects and repairs these days. One of the driving forces is the proliferation of products being offered at home-improvement stores and other big box retailers. Homeowners reason that all they have to do is follow the instructions on the box to get the results they want. However, this couldn’t be farther from the truth. There are too many variables at play in the application of epoxy garage floors. The materials used in the epoxy mixture are not as high quality, so the DIY kits are not likely to offer your floors the same protection. It is also easy to make mistakes in the application as an amateur. It’s much better to hire a professional to put in epoxy floor coatings, ensuring that the materials and the skill used to apply them are top-notch. Many people believe that the only thing they need to do to get their garage floors ready for concrete floor coatings. But the floor has to be properly prepared in order for the coatings to stick to them. Otherwise, the coatings will start to wear off long before they should. Proper preparation not only cleans the floors but also strips concrete dust or other surface contaminants and opens up the pores in the concrete. This preparation ensures that the coatings bond properly to the floor so that they last for decades, not just a few years. A lot of people try to do their own home repair or improvement work because they think it’s cheaper. That’s especially true with a larger job like installing epoxy floor coatings. But the cost of epoxy garage floor floor coating in Queen Creek is likely far less than you think, and the cost of doing the work yourself and then causing damage to your home can end up being a lot more. Exactly how much your epoxy floor coatings will cost depends on a number of factors, including where you live, how large your garage is, and what kind of floor coatings you have chosen. Some coatings are simple and untinted, but others have colors and patterns in them. The reasons that everyone continues to believe this myth is that a lot of people are using DIY kits or hiring inexperienced “professionals” to do the work. They end up with inferior products applied without proper preparation, and the coatings peel off or lose their effectiveness. When experienced professionals apply the coatings using professional-grade products, concrete floor coatings last 10 to 20 years. The better you take care of your floor coatings, the longer they will last. Epoxy floor coatings can transform your garage, taking it from a dingy work space that you only go into when you have to and making it look like a showroom floor. Hire the right professionals to apply your epoxy garage floors and you will get years of benefits out of them. Plus, you’ll protect your concrete garage floor, keeping it free of stains and adding years onto its life. 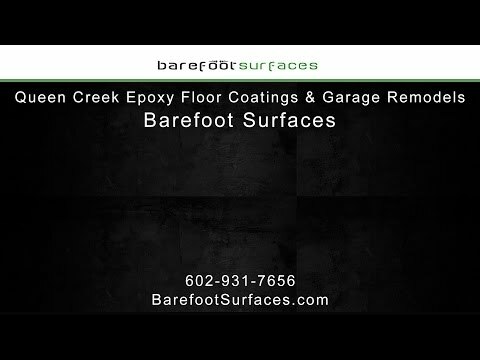 Barefoot Surfaces has been getting superior results for Arizona home and business owners for years. We install beautiful concrete floor coatingsin a variety of designs. You can choose from different colors and patterns, or you can choose to just add a gloss over your floor as it is. Our professionals will ensure that the floor has been properly prepared, and we’ll use only the highest quality materials to ensure long-lasting results. Check out our online gallery to learn more about the options for epoxy garage floors, and then call us in Arizona to get a quote for your own epoxy floor coatings.